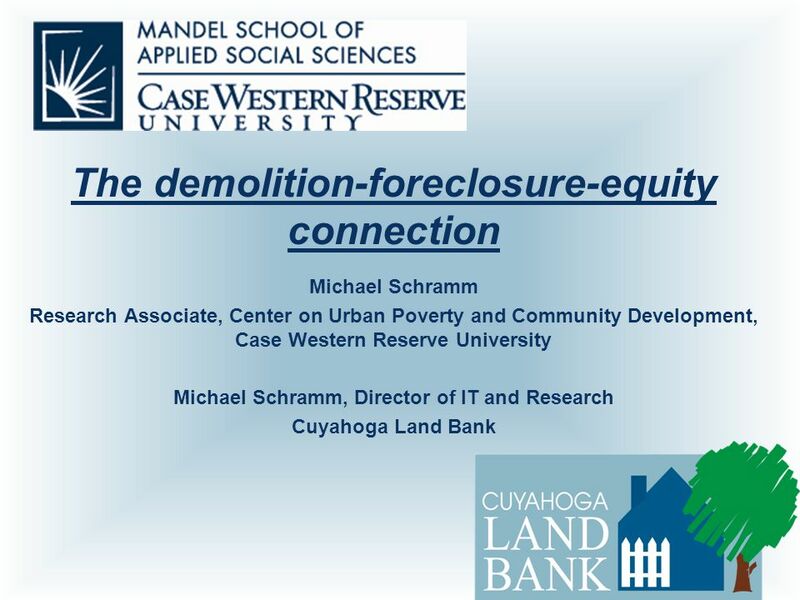 The demolition-foreclosure-equity connection Michael Schramm Research Associate, Center on Urban Poverty and Community Development, Case Western Reserve. 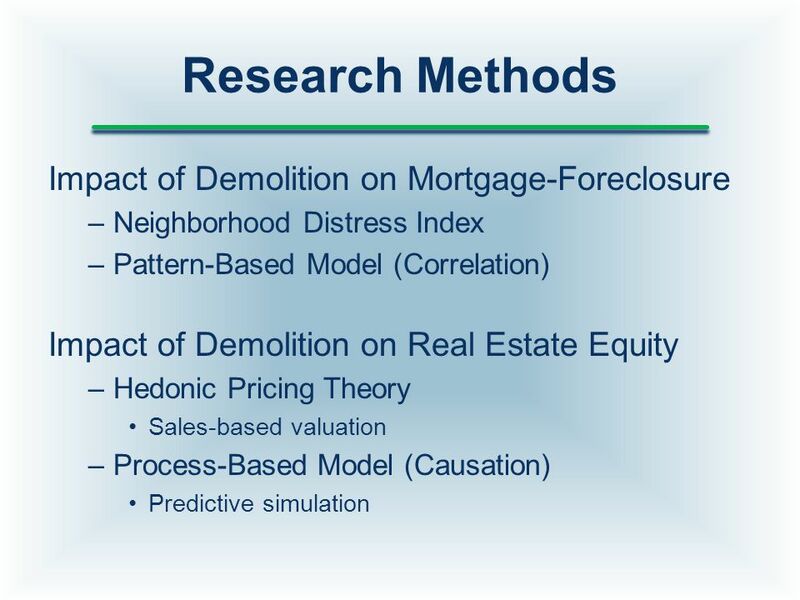 4 Primary Purposes of Study Conduct objective research to test the hypothesis that strategic demolition reduces mortgage foreclosures. Determine how property values are impacted differently by vacant lots and by distressed properties. 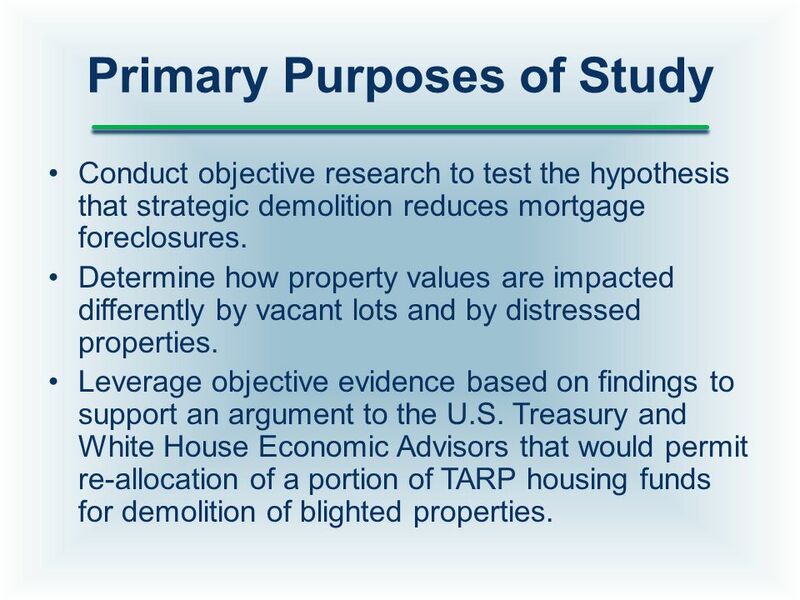 Leverage objective evidence based on findings to support an argument to the U.S. Treasury and White House Economic Advisors that would permit re-allocation of a portion of TARP housing funds for demolition of blighted properties. 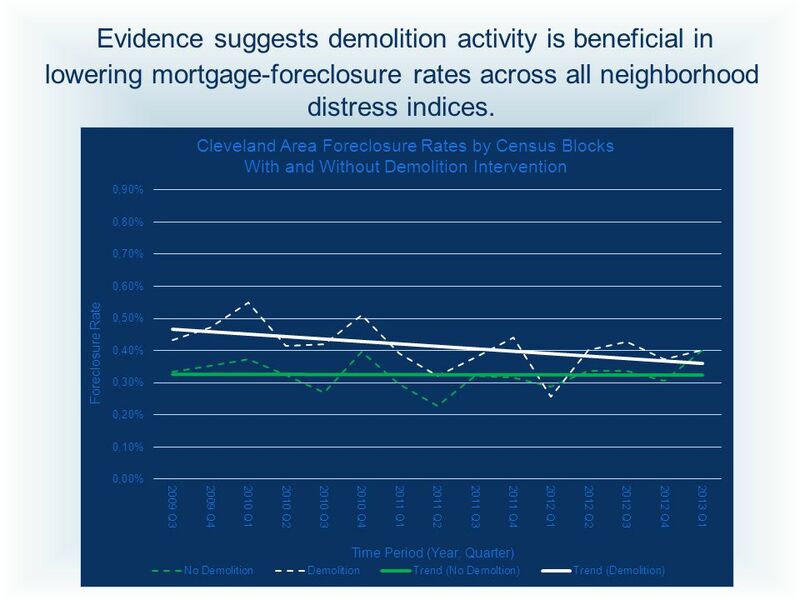 8 Evidence suggests demolition activity is beneficial in lowering mortgage-foreclosure rates across all neighborhood distress indices. 9 Submarkets Place matters. 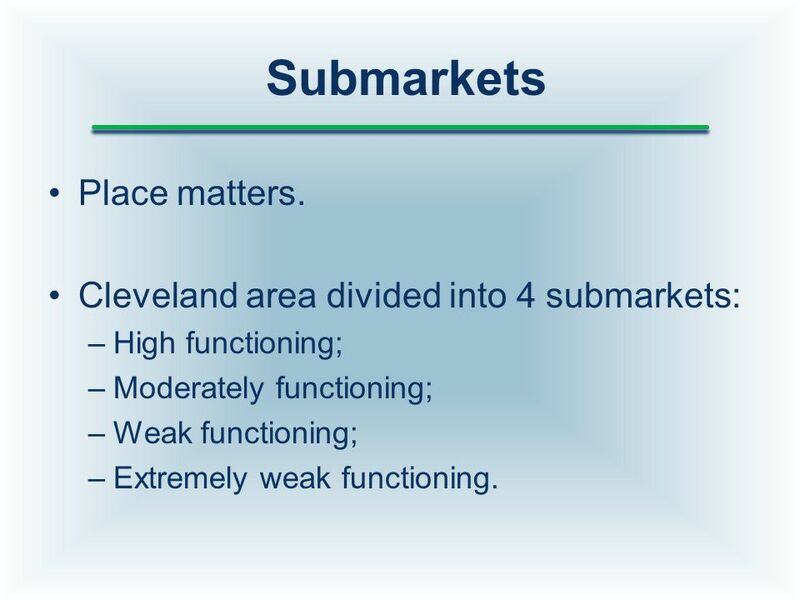 Cleveland area divided into 4 submarkets: –High functioning; –Moderately functioning; –Weak functioning; –Extremely weak functioning. 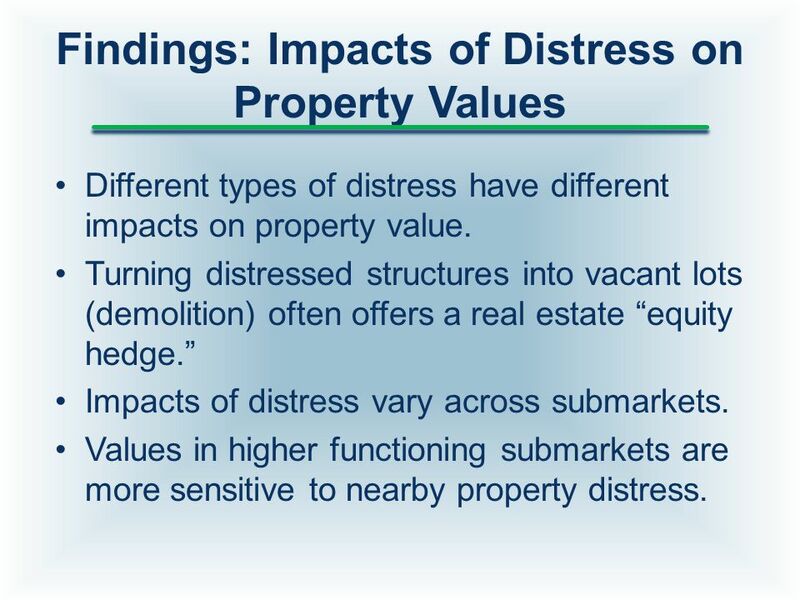 12 Findings: Impacts of Distress on Property Values Different types of distress have different impacts on property value. 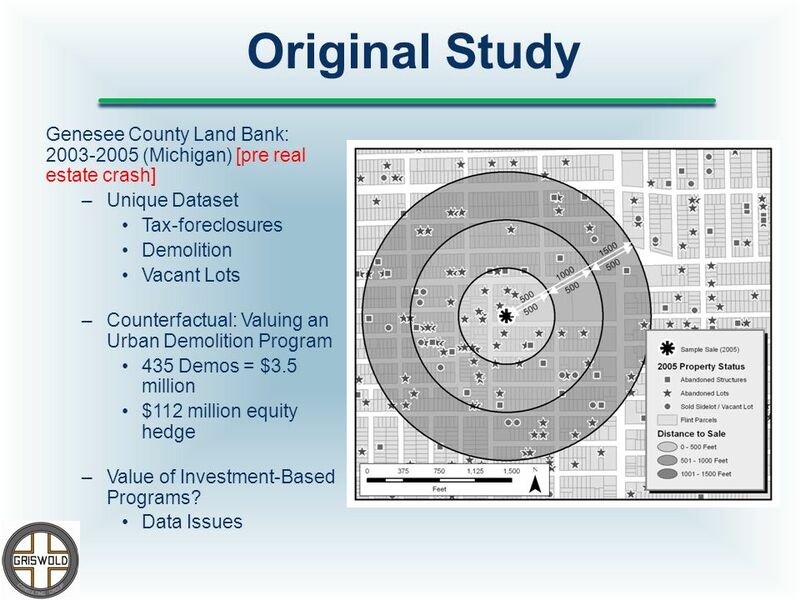 Turning distressed structures into vacant lots (demolition) often offers a real estate “equity hedge.” Impacts of distress vary across submarkets. Values in higher functioning submarkets are more sensitive to nearby property distress. 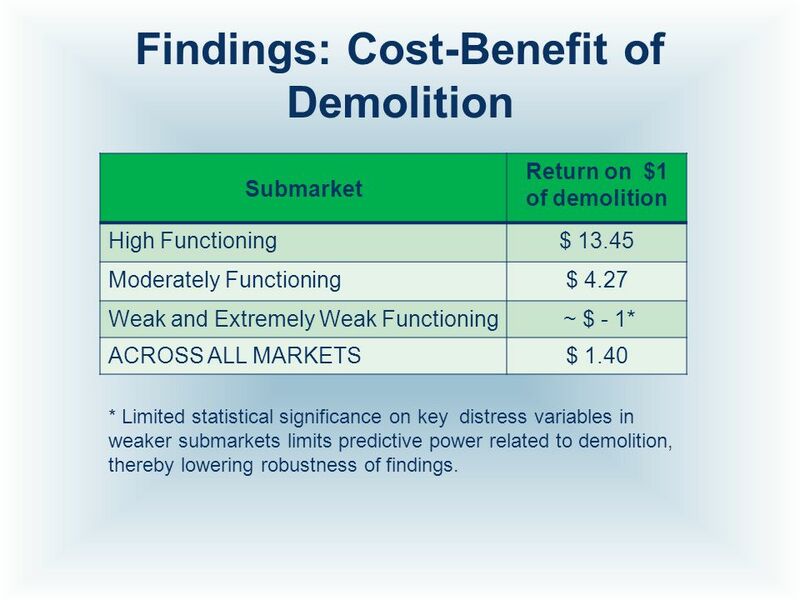 13 Findings: Cost-Benefit of Demolition Submarket Return on $1 of demolition High Functioning$ 13.45 Moderately Functioning$ 4.27 Weak and Extremely Weak Functioning ~ $ - 1* ACROSS ALL MARKETS$ 1.40 * Limited statistical significance on key distress variables in weaker submarkets limits predictive power related to demolition, thereby lowering robustness of findings. 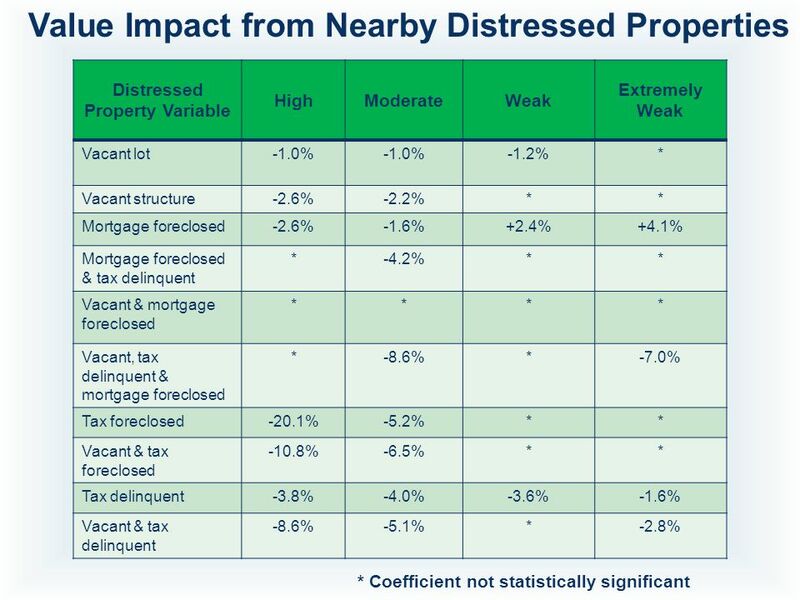 14 Summary Distressed properties negatively impact property values. 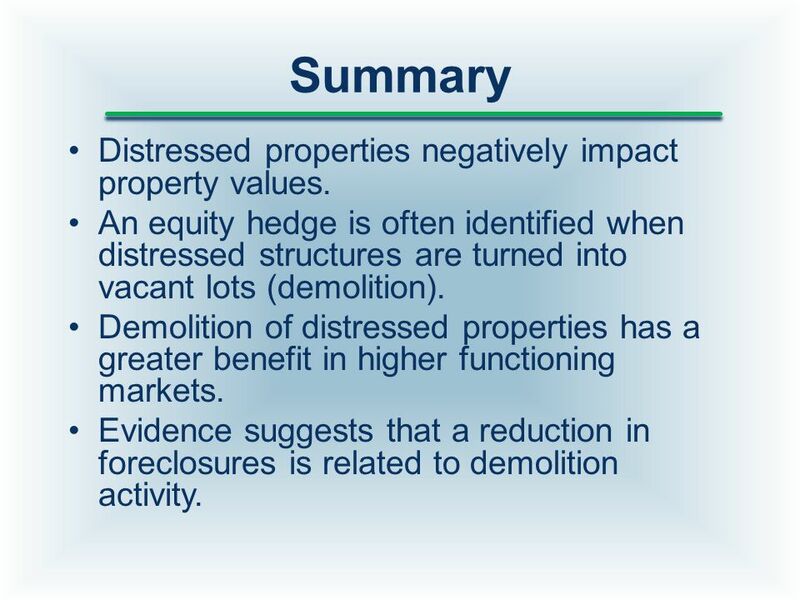 An equity hedge is often identified when distressed structures are turned into vacant lots (demolition). Demolition of distressed properties has a greater benefit in higher functioning markets. Evidence suggests that a reduction in foreclosures is related to demolition activity. 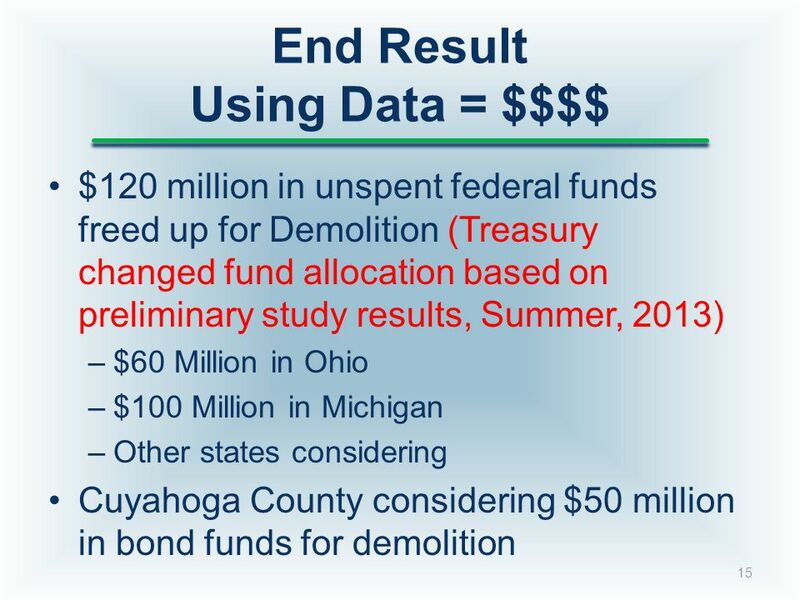 Download ppt "The demolition-foreclosure-equity connection Michael Schramm Research Associate, Center on Urban Poverty and Community Development, Case Western Reserve." 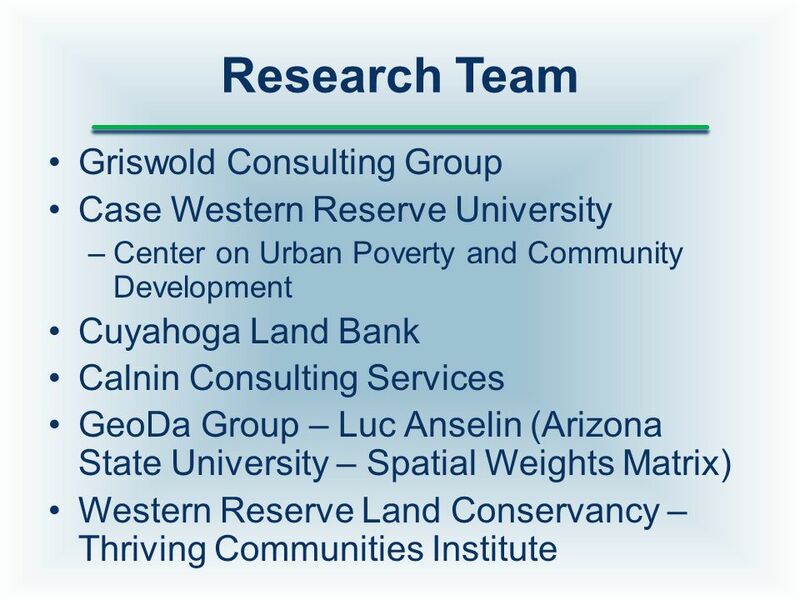 Thriving Communities Institute From Vacancy to Vitality A Program of Western Reserve Land Conservancy Thriving Communities Institute From Vacancy to Vitality. Richland County Land Reutilization Corporation. PRESENTATION Sequencing a Property’s Path Towards Vacancy Presented by the Institute for Housing Studies at NNIP Partnership October. 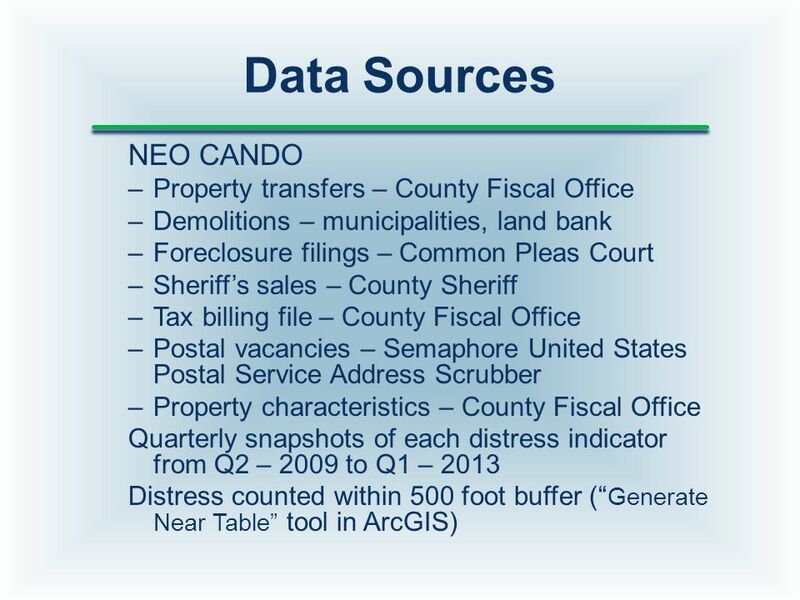 Using GIS in Foreclosure Analysis: A Look at Forsyth County, NC NC Department of Revenue 2011 Advanced Seminar Greensboro, NC September 14, 2011 Presented.  Housing prices increased in almost 90% of US cities in Q  The national foreclosure rate has fallen by 52% since its peak in 2010  4.5 million. Update on Foreclosure and Vacant Property Frank Ford Senior Vice President for Research and Development Neighborhood Progress, Inc. October 26, 2012. Foreclosure Trends Frank Ford Senior Vice President for Research and Development Neighborhood Progress, Inc. June 15, 2012. Targeting NSP Funds Todd Richardson HUD Office of Policy Development and Research. CDBG Supplemental Assistance For The Redevelopment of Abandoned And Foreclosed Homes Title III, Section 2301 of the Housing and Economic Recovery Act of. Neighborhood Stabilization Program (NSP) Orange County, Florida. Stabilizing neighborhoods affected by the foreclosure crisis Alan Mallach Nonresident Senior Fellow The Brookings Institution. 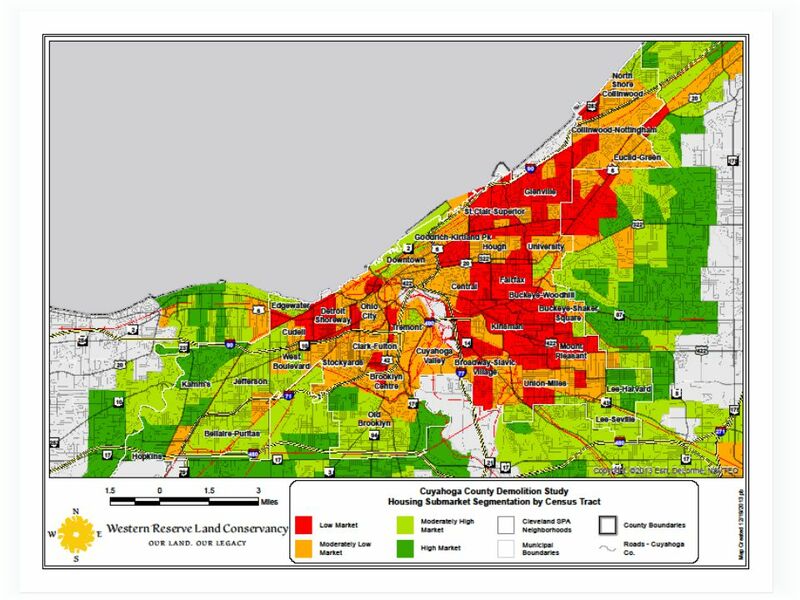 The Clumper: Finding Needles in a Property Haystack Research Associate, Center on Urban Poverty and Community Development, Case Western Reserve University. 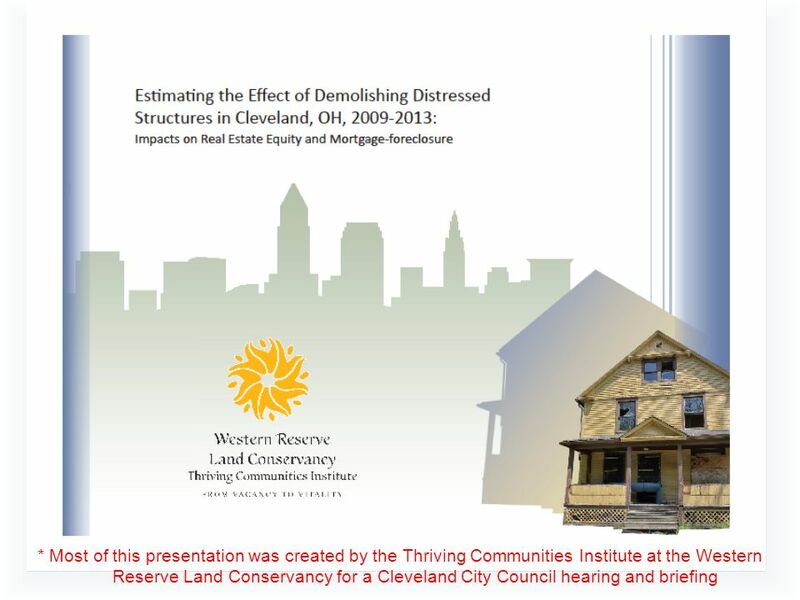 UPDATE ON FORECLOSURE AND VACANT PROPERTY IN CUYAHOGA COUNTY Frank Ford Senior Policy Advisor Thriving Communities Institute November 1, 2013. Sustaining the Single Family Portfolio Post Hardest Hit Fund Rhode Island 2014 NCSHA Conference October 21, 2014 Leslie McKnight, Director of Loan Servicing. City of Pittsburgh – Department of City Planning The Pittsburgh and Philadelphia Stories John Carpenter REDEVELOPMENT AUTHORITY of the CITY OF PHILADELPHIA. A New Future for Our Old Places Liz Hersh, Executive Director, Housing Alliance of PA.
PROPERTY TAX REVENUE GOT YOU DOWN? CSMFO Conference Los Angeles – February 18, 2009 The HdL Companies Sales Tax Property Tax Municipal Software. Michael J. Cox Dept. of Economics CSU Sacramento. Massachusetts Community & Banking Council Economic Development Committee June 10, 2010. PROPERTY TAX REVENUE GOT YOU DOWN? CSMFO Conference Los Angeles – February 18, 2009 The HdL Companies 909.861.4335 Sales Tax Property Tax Municipal Software.